(CNN) The mayor of a seaside town on the French Riviera is sticking by his town's burkini ban, telling beachgoers, "if you don't want to live the way we do, don't come." "You have to behave in the way that people behave in the country that accepted you, and that is it," Cogolin Mayor Marc Etienne Lansade told CNN. "If you are accepted in Rome -- do like Romans do," he said, adding, "go in Saudi Arabia and be naked and see what will happen to you." Lansade, of the right-wing National Front political party, is maintaining the ban despite a ruling by France's highest administrative court that mayors do not have the right to outlaw burkinis. He's not alone. Several French mayors are also enforcing their bans in the face of Friday's ruling, which concerned the nearby town of Villeneuve-Loubet although it could affect cities around the country. Did Trump visited France recently? In Saudi SArabia, Pakistan and bangladesh if yuh Buckta show, yuh Rass in hot wata. I guess that's the price you pay for freedom. You have evidently never been to any of these countries ! The burkini debate in France goes to the heart of the French Revolution's idea of separation of Church and State. Coming just after the US Revolution against Britain, the French took the American idea (previously French Liberté, Égalité, Fraternité) to the extreme. They want no part of church in public life. This is what is fueling the ISIS idea that you cannot be French and Muslim at the same time. It's the same thing about Belgium, and these are the two countries that have seen most ISIS-inspired attacks. Then there is the ghetto-ization of the Arab immigrants in those two countries that lead to alienation from general European society. None of the above excuses any terrorist organizations from perpetrating the horrors we've seen. It's just to injectthe historic antecedent in the debate. The French are correct. Wearing these for ceremonial purposes is one thing, making it a way of life is another! Some traditional wear is ok, but there should be limits and who cannot comply, well they cannot work, etc for the Govt and Corp will decide their policy. That full-face hijab should be banned from public. This is a terrorism issue! Fueling ISIS ideas, give me a break!! Muslims have been finding excuses to kill each other and other "infidels" for 1,400 years. The core teachings of that faith lends itself to barbarism and inhumanity as we see today! Christianity, Hindu, Buddhism, all major religions teach the concept of after-life reward and consequences for acts during your earthly life. Islam is the only religious doctrine which reward you in the after-life for committing the most heinous of acts and even against the most innocent of humanity! This makes it a doctrine of pure evil! The handle that you are using is quite appropriate because it appears to properly describe your knowledge and mentality ! You seem to be completely ignorant of what Europeans nations perpetrated on the Maghrib states not so long ago so it should do you good if you would take some time to acquaint yourself with the history of North Africa before spewing such utter rubbish as you have done above. FYI, France and Belgium invaded, occupied and looted and pillaged these countries throughout the period of their lengthy occupations before they were forcefully booted out. The small handful of Arabs who were 'oh so kindly' permitted to emigrate to Europe are being treated like refuse by both France and Belgium ! These people are denied rights, privileges, education and jobs at every turn and have no choice but to live in the squalor of ghettos. Now, some (like you !) want to tell them how they should dress, worship, live, etc ! Have you ever been to France and Belgium, have you ever seen how these people live ? Now you want to dictate what elements of their cultural and religious practices should be allowed ....even though you evidently know little/nothing about them! Why don't you quote for everyone's benefit 1) the 'core teachings of Islam that lend themselves to barbarism and inhumanity' and 2) the 'doctrine which reward you in the after-life for committing the most heinous of acts and even against the most innocent of humanity' ? If you have any balls ....back up what you posted !! What people like Trump, many on the fringe Republicans and their supporters, right wing peoples of other western countries fail to understand is that some of those Muslims they believe are from some other place are actually from right where they are told to go back to somewhere other than where they are. That shows the stupidity of these people. 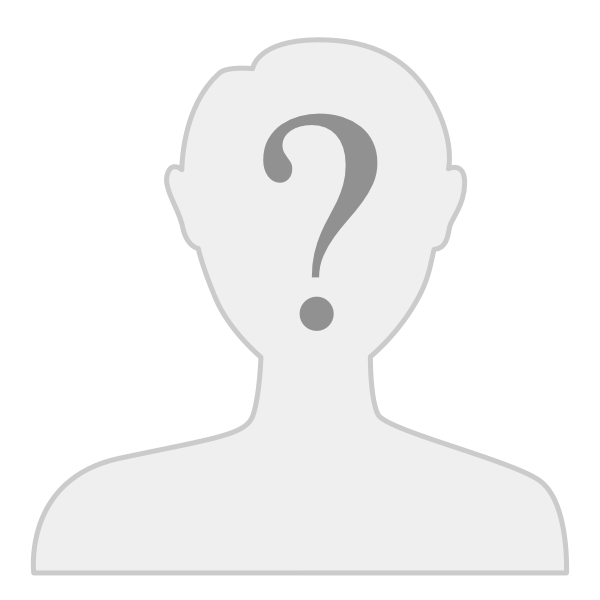 The former Al-Qaida member who was recently hired by Washington Unuversity as a Professor is a purebred white American who was born in a Christian home and spent part of his early years in prison prior to becoming a Muslim. So people like this mayor would be silly to tell this Professor that he should be grateful that America and Americans generously give him a country to live in. Only problem though Keffer is that the wrongs should not continue. No doubt that Europe mercilessly abused the rest of the world. However, what those Muslims are doing today is inexcusable. Worst yet is how many of their 'own people' they are killing. ISIS number 2 guy probably got killed yesterday. It would be wonderful if Al-Baghdadi can be next. Then, hopefully, the others will put down their weapons and pick up the Qur'an and truly learn to live with others. The burkini debate in France goes to the heart of the French Revolution's idea of separation of Church and State.. Nothing to do with that. The French would love it all of those Muslims from North and West Africa became Catholics. The French aren't good at incorporating diversity. In the French Antilles up to the 1990s their text books still told them that they are Gauls. The attitude is that these islanders are French and true French are Gauls, so that the creole culture (a Franco African blend with Amerindian and East Indian influences) is irrelevant, and at best quaint, but not serious. Its very interesting that no serious municipality in the USA or Canada will ban the burquini) and yet I doubt that there are any burquinis around. One day the French will look at the Americans, Canadians, and to a lesser extent the British, in how they absorb immigrants. They insist that immigrants learn the language, acquire education, develop the hard and soft skills needed to be absorbed into the labor force and attain upward mobility. And aside from that be as tolerant of others as they want others to be of them. The French demand that immigrants, or former colonial people behave like the Gauls. Even the Corsicans have problems dealing with the French. Yet they have problems with their immigrants in ways that Americans and Canadians don't. Do you know that for every European that jihadists kill they kill 10,000 Muslims? So does past abuse of Maghrebis by the French justify terrorism? You do know that Congo suffered way more at the hands of the Belgians than Algeria suffered at the hands of the French yet you don't see Congolese crashing trucks in Brussels. In fact terrorism by jihadists just reinforces the claims of bigots like Trump and Le Pen. I did not and will not in any way suggest justification for any killings, wrongs etc. committed by Muslims in France, Belgium or any European country. Hurting innocent and unrelated people is and will always be completely unacceptable to me. What the world has been silent to, however, are the blatant and ongoing discrimination/oppression of Muslims, particularly the younger ones, who have been living in Europe (primarily France & Belgium). Most, in fact close to 100% of them, were born there and have never been to any of the Maghreb or other Muslim countries. Because of their heritage/religion/ethnicity they have been encountering unbelievable difficulty with employment, admission to institutions of higher learning, access to health and social services etc. so it should not come as a surprise that tension and resentment for the governments of France and Belgium is a as high as it presently is and escalating even further. What I am pointing to are the root causes. In a nutshell; if you do not address these issues, the symptoms will never go away. ISIS, however, is a totally different problem; I cannot think of anything positive that can be attributed to them and any of their actions. Baghdadi and his gang are badly out of touch with truth, civility, decency and Islamic doctrine and will therefore have to be eliminated; one way or another ! However, one must understand and clearly recognize the injustices that were perpetrated and are continuing in the Middle East and I do not have to tell you by what countries; that is public knowledge ! I have a problem with anyone, whose sources of information are restricted to CNN and BBC, and considers it acceptable to dictate restrictions on the cultural practices of others. You seem to have a comprehension problem, my friend; where did I say that past injustices of the French justify terrorism by people from North Africa ? Please read my post immediately above. There are not a lot of Congolese people in France; I can tell you that. Loads of Senegalese and Malians and they don't go around behaving like Jihadists. I suspect that they get even WORSE treatment than do Maghrebis. In fact in every Jihadists attack in France Maghrebis were among those killed. So the rampant discrimination against Maghrebis can never be used to justify the lunatic behavior of a small minority of them. Hey, you kill an infidel, by any means, you will be rewarded in heaven with umpteen virgins. Which frustrated young man would not try his faith and see what comes out on the other side! 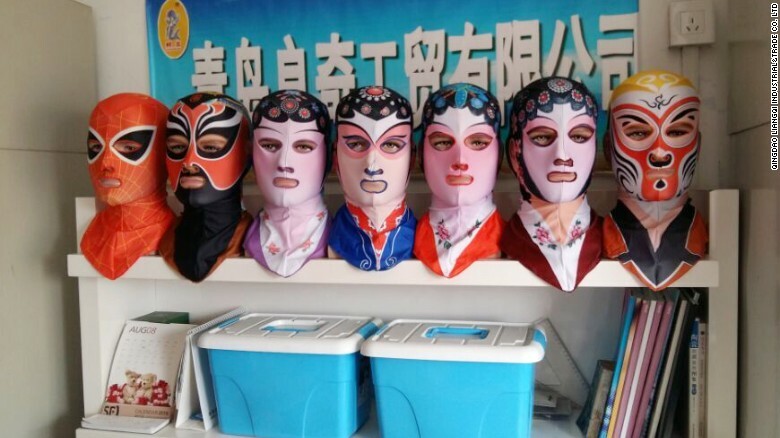 Zhang Shifan claims to be the inventor facekini. This design inspired by traditional Peking opera is among a number of new designs released by her company. (CNN) A French ban on the burkini -- a swimsuit that covers the whole body except for the face, hands and feet -- has prompted fierce debate, but women in one part of China are wondering what all the fuss is about. 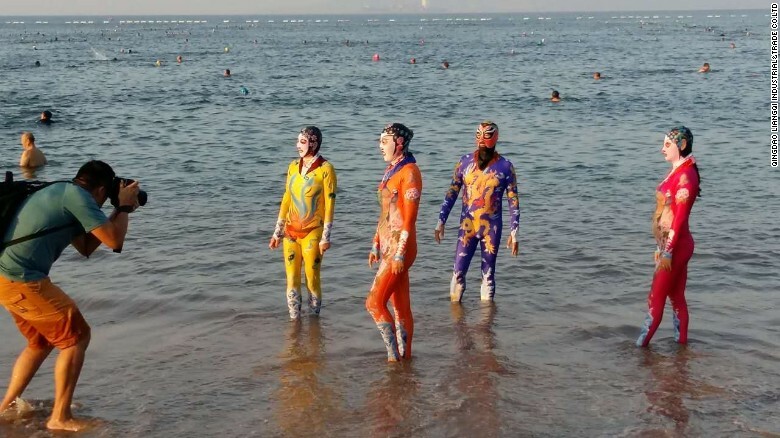 The "facekini" has been popular attire on beaches in eastern China for several years, especially in the city of Qingdao, a seaside city of 9 million. The skin-tight elasticated fabric masks cover a swimmer's entire head and neck. Holes are cut for eyes, nostrils, mouth and, in some cases, pony tails. Most facekinis cover up the rest of the torso as well. "I've been using a facekini for nearly ten years," says Wang Huimei, 58, a Qingdao local who goes to the beach almost everyday in summer. Zhang says she's sold more than 20,000 facekinis this summer. "It's way better than sunscreen lotion that wears off whenever I get inside the water. Plus, the water in this area tends to be cold, it's comfortable to wear and it keeps me warm." Zhang Shifan says she's the inventor of the facekini and has sold them on Taobao -- China's equivalent of Amazon -- since 2007. She also has a brick-and-mortar store. The garment was originally designed to protect people from jelly fish bites. "Suntan protection was a secondary feature but now it's the major appeal to my customers," she adds. The latest facekini designs have creating a stir online. Zhang says she's sold more than 20,000 facekinis this summer. She released an arresting series of new designs in July that draw inspiration from traditional Peking opera and wild animals. British retailer Marks and Spencer has seen sales of full-body bathing suit or burkinis rise. 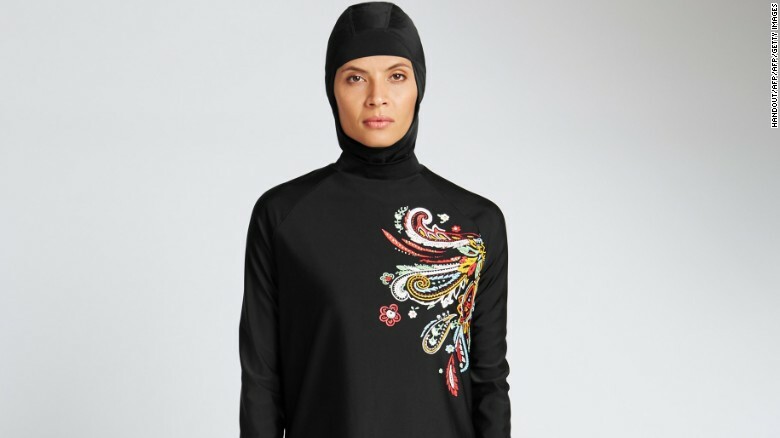 But while burkini makers have seen a spike in sales as a result of the attempt by some French politicians to prohibit religious attire ion public beaches, Zhang says she hasn't had much success selling outside China. "We've tried promoting our products overseas after the pictures of our products went viral, but it didn't turn out well. We've only had small orders from Australia, Hong Kong and Taiwan in the past few years." The facekini covers up the whole face and neck with slits for eyes and mouth. Buyers tend to be middle aged women like Wang, who adhere to traditional standards of beauty that value paler skin. The garments have sparked some debate in China, with the pictures of the latest designs widely shared on social media this week. Some Internet users found the designs amusing and creative; others found them shocking. "Ask French police to arrest them!" one user of Weibo, China's version of Twitter, commented on the photos. Wang hadn't heard about France's efforts to ban Muslim women from covering up their bodies on beaches. "I can't really make sense of it," she said. "I thought it's the bikinis that could be banned." Verrrry good !! You are a bright guy; now how about you sharing the exact reference... text, chapter, verse, etc !! Go ask Bhagdadi or them Saudi Wahabs or the Queens fullah posse. Them got the hole thing down, word and verse!! I asked you to specifically support the following (that you posted above): "Islam is the only religious doctrine which reward you in the after-life for committing the most heinous of acts and even against the most innocent of humanity!" You were evidently unable to do so and responded with another nonsensical rant. There ought to be penalties for idiots like you who post garbage with the expectation that it will not be noticed !